Bacon can absolutely change the world. I'm certain of it. We've been making bacon cookies (again), putting it in our bourbon, and I know a few vegetarians who will be enticed into meat eating by the smell of bacon cooking on a Sunday morning. It's a powerful smell indeed. But that doesn't necessarily mean that I want to smell of bacon. I like chips, but that doesn't mean that I want to smell of my local chippy. Recently my friend Kavey picked up some bacon soap while she was shopping and I'm more than a little curious. Is smelling of Frazzles a good thing? 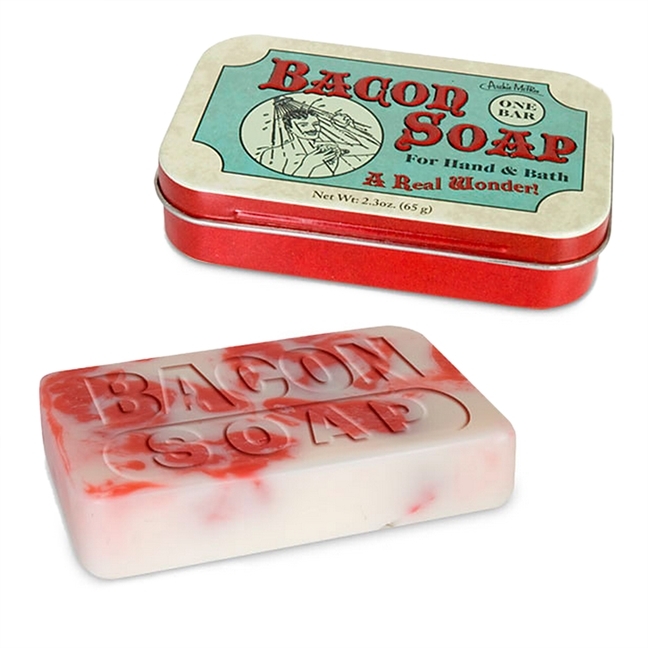 If you used bacon soap the morning after the night before, would you suddenly be feeling fresh as a daisy and hangover free? Or does the idea of smelling like tasty bacon fill you with shudders? It comes in a retro tin and it's £5.99 from Find Me A Gift. Oh, and I've double checked: it is kosher. This bacon thing has gone too far.